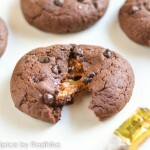 These cookies are the fudge-iest, chewiest and chocolate-iest cookies you will ever eat. 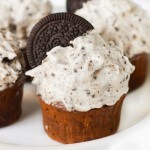 You will (literally) not be able to stay away from these. 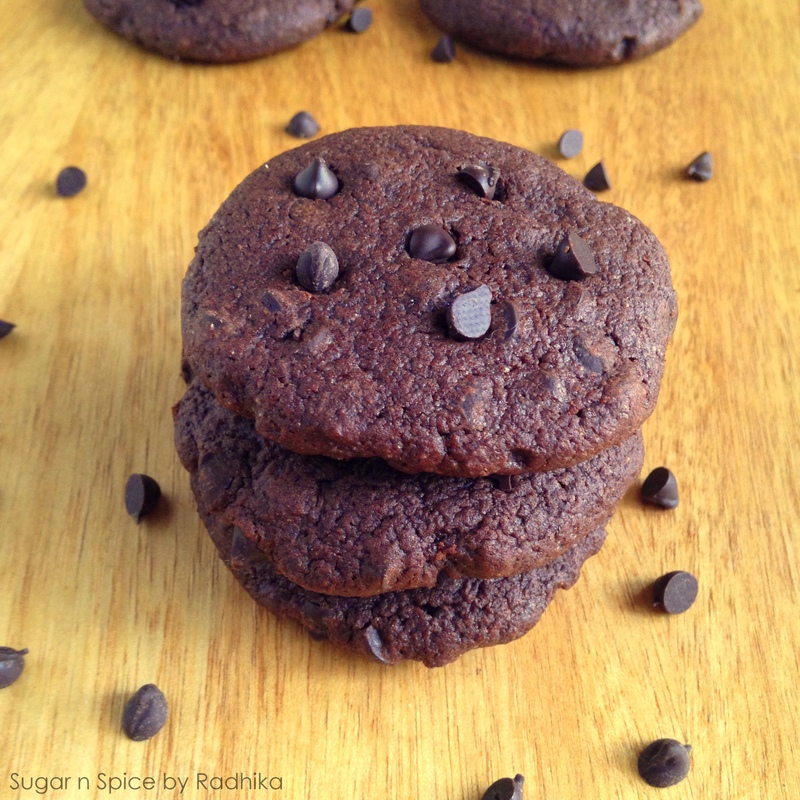 Read the recipe for two versions of these Ultimate Dark Chocolate Chip Cookies! I made the best possible dark chocolate chip cookies and I’m chuffed! I’m so glad because its not everyday that I do everything right and bake cookies that are out of this world. 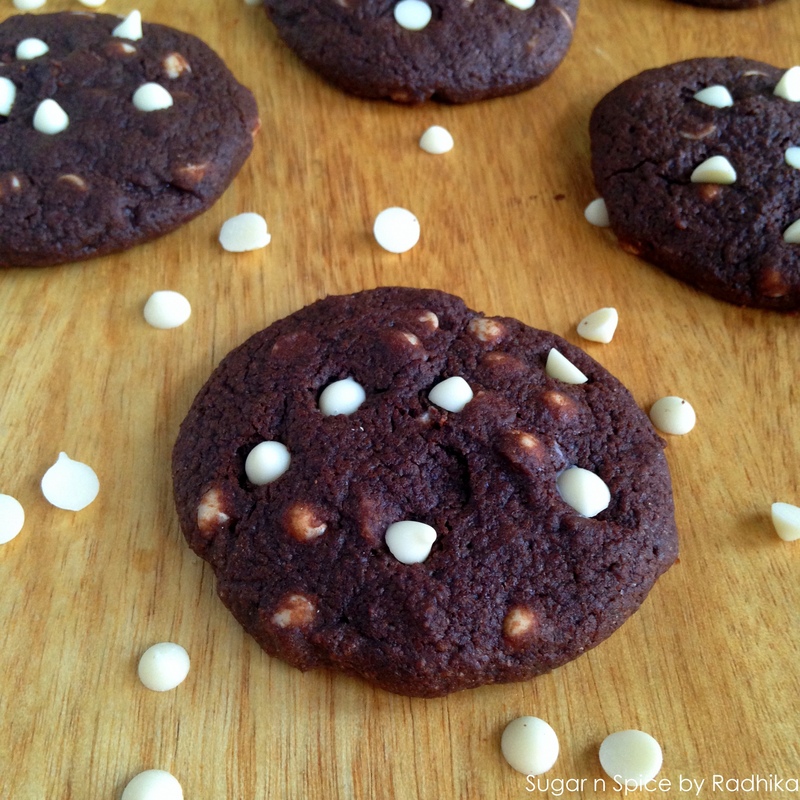 These cookies had everything a chocolate lover could ask for, the fudgy bite, the chocolate overload and the right amount of sweetness. No one, I mean NO ONE can fault these cookies, because they’re perfect! I’m so glad because when it comes to baking I’m a little disaster prone. A while back, I had a craving for double chocolate chip cookies and I baked them. Assuming the dough would be perfectly alright even if I “over chill” it, I let it chill for upto 18 hours when the recipe called for 2 hours. I baked the worst possible cookies of all times. Burnt from the top, burnt from the bottom, nothing was right about those cookies. They were like little volcanoes erupting steam and smoke! They were good for one thing though, as a Self Defense Weapon. Those harder than stone cookies could kill someone had I hit them with it. Not kidding! I’m glad I’m learning now and my journey to producing edible food is running smoothly..except for a few bumps here and there 😉 These dark chocolate chip cookies are the ULTIMATE ones, you will not go back to any recipe after you try this. If you’re looking for a little twist on chocolate chip cookies, you can also try my Chewy Chocolate Chip Cookies I baked for Christmas. They were a master piece! 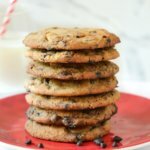 I baked two varieties of these dark chocolate chip cookies, one with white chocolate chips and the other with dark chocolate chips and both of them were amazing. I cannot choose which one I would’ve liked to eat more. Gun to my head, I’d probably choose the white chocolate chip ones because they look absolutely adorable! 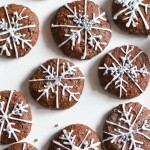 These cookies were fairly easy to make with only about 20 minutes in preparation time. Unlike most of my cookies this one has eggs. The egg gives it extra moisture and makes these cookies extra chewy. They almost taste like cake. Please make sure that you use a room temperature egg because a cold one will not mix properly. Once you form the cookie dough, which is a treat in itself, you have to refrigerate the dough for about an hour. It is absolutely necessary to refrigerate the dough so that the cookie dough becomes easier to handle because it is really sticky. Once refrigerated, it becomes easier to make the dough balls. These cookies are rather chewy, so if you’re looking for something crispy then refrain from baking these ones. 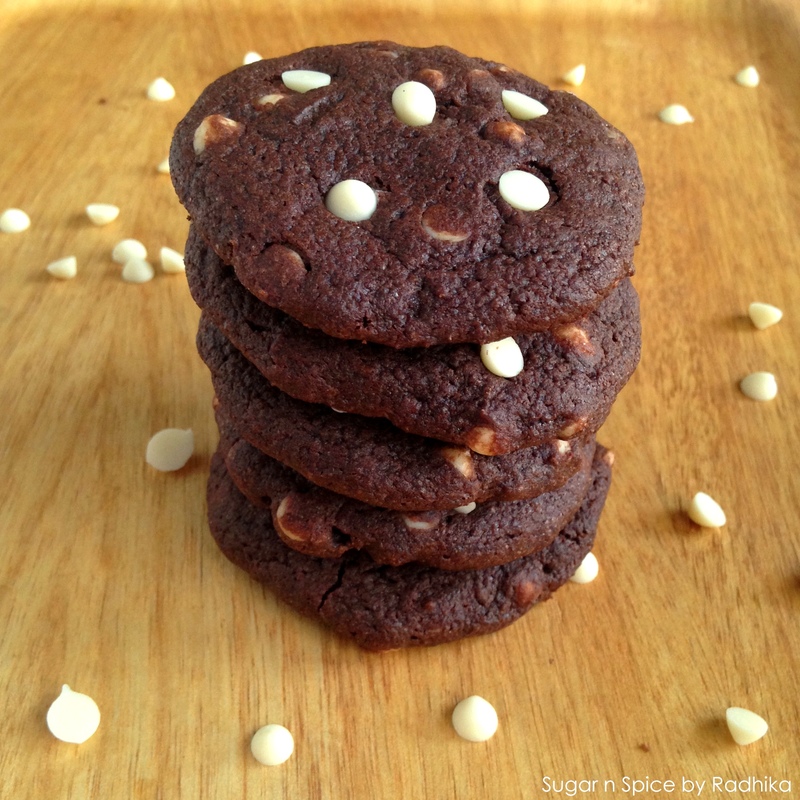 They are delicate little, almost cake-like cookies that have a fudge-y chewy texture to them. Not crispy at all. I baked these for 15 minutes to keep that chewy factor intact, I haven’t tried baking them for more than 15 minutes so I can’t really comment if they’ll be crispier if you bake them longer. Once you take the cookies out of the oven, they will be really soft. They will harden a bit once they cool down so don’t panic. 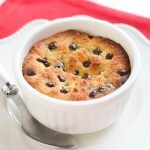 While the cookies are hot and soft, stick a few chocolate chips on top of them and press slightly. It gives them this beautiful look, because no matter how carefully you place chocolate chips on top of cookie dough before baking they still don’t look pretty enough. This works for me, just be careful while sticking the chocolate chips because the cookies are really soft and could break. Let the cookies cool down on the baking tray for 15 minutes before you transfer them onto a wire rack and let them cool for another 15 minutes on it so that the chocolate chips you stuck on top of them cool down too. * If you want to bake half white chocolate chip cookies and half dark chocolate chip cookies, take 1/3 cup white chocolate chips and 1/3 cup dark chocolate chips (in separate bowls), divide the cookie dough in half and add the chocolate chips. If not, simply put, 2/3 cup of chocolate chips of your choice. Whisk the butter until light and fluffy in a bowl. When the butter is pale yellow, add in the sugar and whisk again until completely incorporated. Whisk egg in a separate bowl and add it along with the vanilla essence to the butter sugar mix. Whisk for a few seconds until everything is properly combined. In a separate bowl sieve the flour, baking powder, cocoa powder and salt. Mix it properly and add it little by little to the butter mix made in step 1. Mix with a spatula or spoon, ditch the whisk. Add in the milk to form a smooth dough, the cookie dough will be sticky. Add in the chocolate chips. 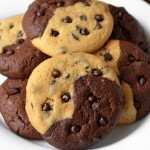 If you want to bake half white and half dark chocolate chip cookies, divide the dough in half and place them in separate bowls. 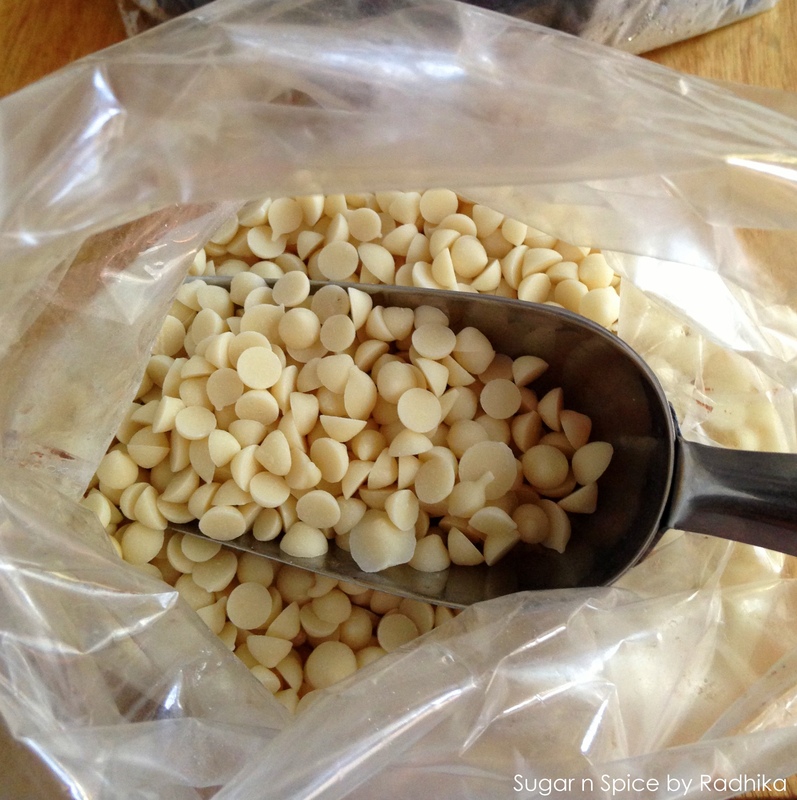 Mix in the 1/3 cup white chocolate chips in one and 1/3 dark chocolate chips in the other with a spoon or spatula. Wrap the cookie dough or doughs in cling film or plastic wrap and refrigerate for an hour (maximum 2 hours). Preheat your oven at 200 degree Celsius, while you line the cookie on a baking tray. Take 1 and a half tablespoon of cookie dough in your hand and make a ball, then flatten it out slightly and place it on the baking tray. Do not over crowd the baking tray these cookies will spread a little. Bake the cookies at 180 degree Celsius for 15 minutes. The cookies will be soft when you take them out, allow them to cool on the baking tray for 15 minutes before transferring them on a wire rack. 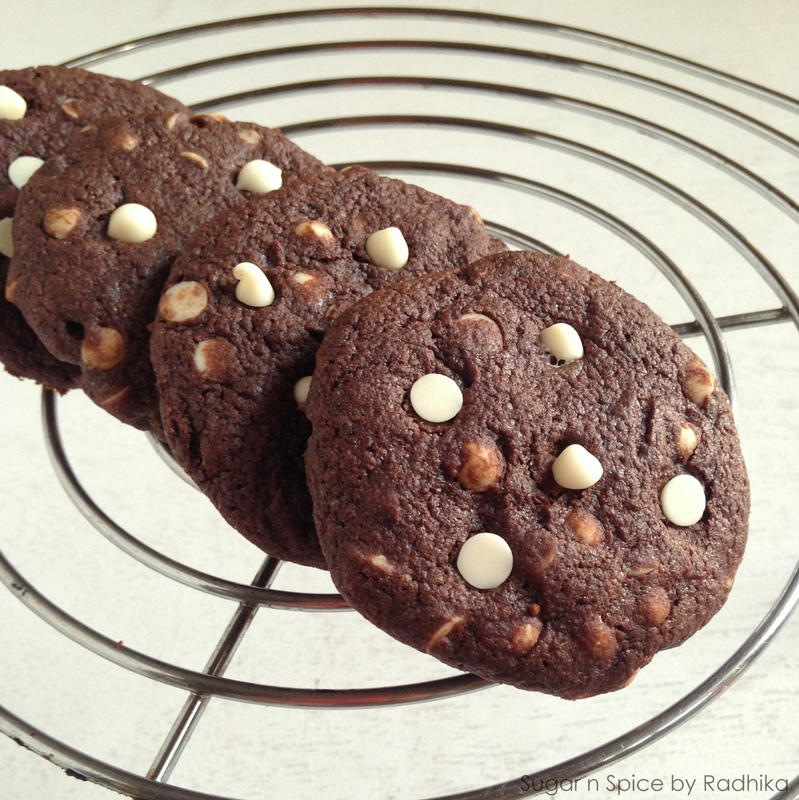 *While the cookies are still soft, decorate them with a few chocolate chips on top. 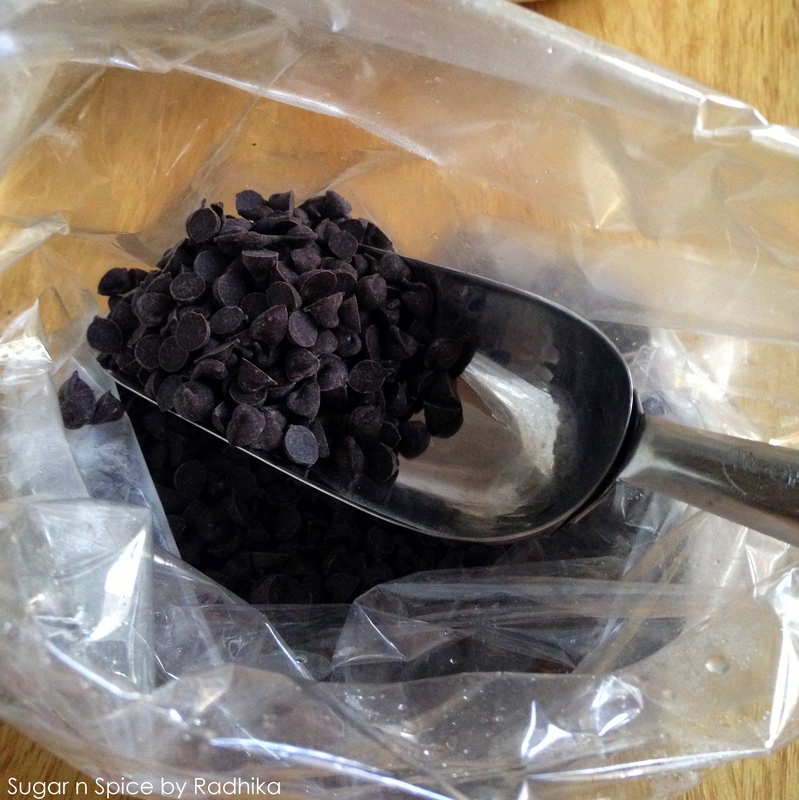 Simply place chocolate chips on top of the cookie and lightly press. Allow to cool and enjoy! The cookies will stay fresh up to 8-10 days in an air tight container. I suggest you eat them within 5 days! I just made these myself and LOVED them! Thanks for the recipe! You take the best pictures! Every time I see a post from you, I get very hungry! Great job! 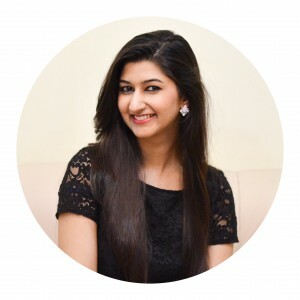 Love dark anything made of dark chocolate 🙂 Tempting feast Radhika! Thank you!! It was hard keeping my hands off of them! wow awesome cookies. chocolate on chocolate say no more! so glad I found your site! I’ll let you know how the cookies turn out. I can’t wait to eat them. 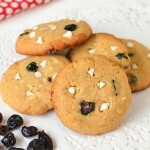 I’m so glad you liked the recipe, these cookies are my favourite ! I’m sure you’d love them! Please let me know how you get on.. I’d love to know what you thought about them! 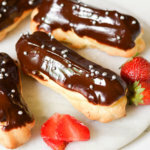 These look wonderful! I can’t wait to try them. 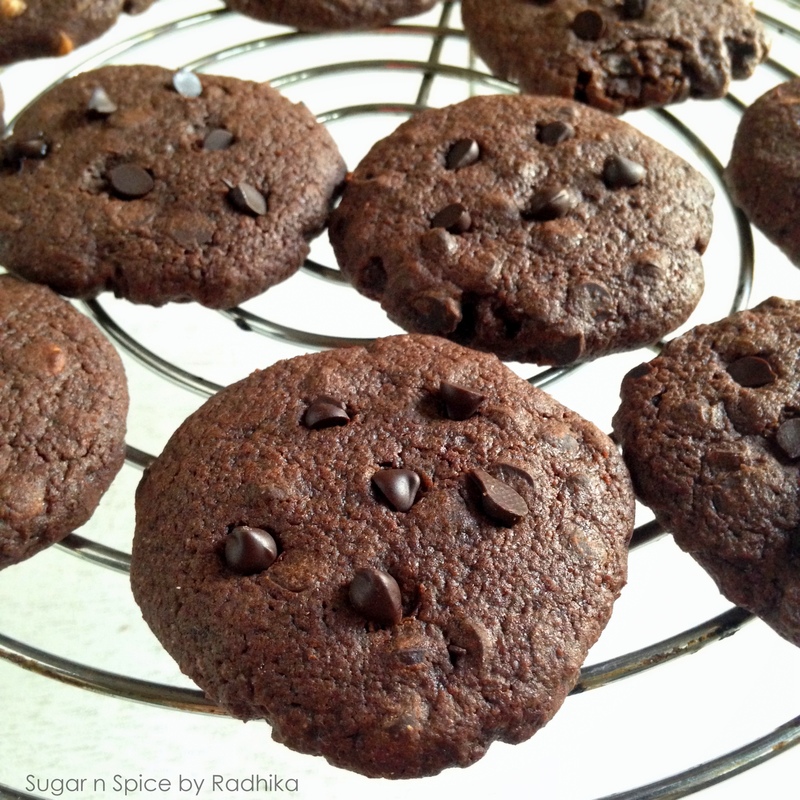 Hi radhika i want to bake dese cookies bt brown sugar is not available with me…. can i use normal white sugar…..?? Yes of course! You can use white sugar, it won’t effect the taste only the looks and texture. White sugar cookies spread a bit more and are crunchier than dark brown ones. If you don’t mind that then go ahead and use it! They won’t be the same but will definitely taste great..! To avoid cookies from spreading too much try not to flatten them too much before baking and refrigerate them for full 2 hours (make sure they’re tightly packed in a cling film or foil). Hope you like these! Let me know how they turn out! Good luck! hi. can this cookie be made without eggs? Just had a question… could you tell me how many grams is 1/2 cup butter? Was wondering whether dermererra sugar is d same as dark brown sugar. If dere is any particular brand dt u use.